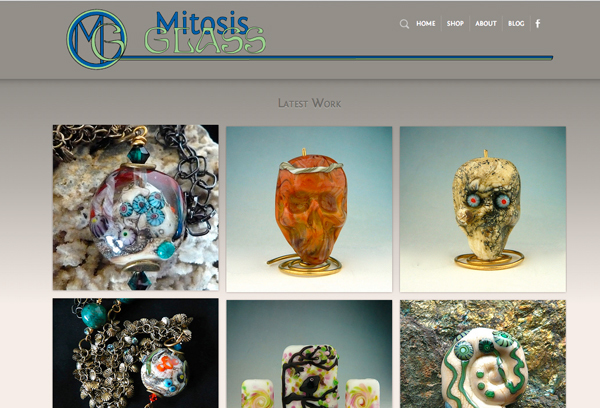 Recently the artist behind Mitosis Glass came to me for some help on her website. She had WordPress installed, but none of the themes she tried were exactly what she wanted. They all still looked like blogs. So I whipped up several designs for her to choose from. She has a store on etsy for selling her art glass beads, and eventually she’d like to have a full shopping cart and webstore, but for now she wanted an easy way to showcase her etsy listings on her website. I created a Pinterest-style layout for her current work that automatically updates from Etsy, so that when she changes listings there, they change on her website as well. I also added a project slider that allows additional information for each image, and some custom scripts for the search bar, and header. All in all, for a small investment, Mitosis Glass has a website that is professional, and represents her brand and her work.